His work takes a structure whose forms and images are dictated by his old memories in different places.This highly personal figurative sculpture is just as likely to take inspiration from the images of internet, magazine, or snapshot. However, it is not an easy quotation. It speaks of familiarity that provides a starting point for his works to acquire new identities suffused with ambiguity. Jang's work transforms the two-dimensional into the three-dimensional in order to construct more scientific and spiritual notions of identity.The process of collecting images is reminiscent of recollecting memories.According to the artist,the accumulation of multi-layered images is actually“a kind of dedicated performance to visualize affection toward a woman.”Very personal. But the collaged photographs of his daily experiences act as common areas of recognition that ground his work in a shared reality, igniting unconscious associations in the viewer.The result is a rich infusion of individual memories and collective associations. Never intended to represent a specific story, his work occupies a gray zone. It is the zone of reinterpretation. Numerous fragments of plastic and photographs have metamorphosed into a hybrid being that challenges pictorial convention and stretches possibilities of mixing fragmented memories into a single entity. 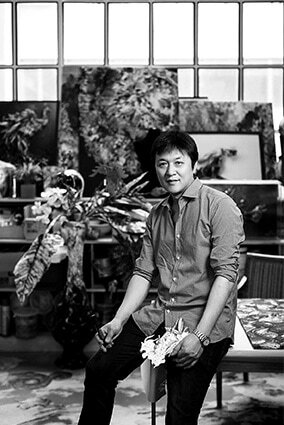 Presenting a cacophonous composition of mechanical rigidity and organic fluidity, Jang‟s new photo sculpture shows inventive negotiation between geometric abstraction and anatomical figuration.The abstract qualities in figuration and figurative qualities in abstraction are interwoven to create the unprecedented structure of images. Images become solid like muscles while structures become floating like images.The use of highly artificial combinations of shimmering, curvaceous cuttings makes his work look closer to a futuristic illusion, which adds materiality to images and very contemporary look to his work. 장승효 조각의 정체성 문제의 출발점은 2차원의 평면 이미지이다. 그러나 보다 과학적이면서도 감성적인 차원의 정체성의 개념을 구축하기 위해 작품은 2차원의 평면 밖으로 나와 3차원의 공간이 되기를 시도한다. 이미지를 수집하는 과정이 옛기억을 재구성하는 과정을 닮았다. 작가는 자신의 작업 과정을 " 한 여자를 향한 애틋한 마음을 형상화하기 위한 퍼포먼스"라고 묘사한다. 매우 구체적이고 개인적이다. 그러나 이를 위해 수집한 이미지들은 익숙한 일상의 풍경, 사건의 파편들이고, 이 익숙한 이미지들이 모여 만들어 낸 콜라주는 관객들로 하여금 자연스런 연상작용을 가능케 한다. 비록 사이버틱하고 미래지향적인 형상을 취하거나 신화적인 모티브를 차용하고 있지만 그 바탕이 되는 지지대가 일상이기에 관객은 장승효의 새로운 시도를 이질감 없이 받아 들일 수있다. 결과적으로 장승효의 작품 속에는 개인적인 기억과 집단적인 연상작용이 동시에 숨어 있음을 알 수 있다. 이 중간지대에서 새로운 해석의 가능성을 엿 본 것일까? 어떤 특정한 하나의 이야기를 전달할 의무감에서 자유로워진 장승효는 중간지대에 남아 있기를 두려워하지 않는다. 장승효의 작품에서 정체성의 문제는 그 시작점과 그 종결점을 분명히 하지 않는다. 작업 과정에서, 이미지를 쌓아 올리는 과정에서,그리고 작품과 관객의 상호작용 속에서 그 형상과 방향이 모호해 진다. 그러나 그의 조각은 스스로 진화를 시도하는 독립적인 객체이며 동시에 주체이기도 하다. 확실한 것은 불확실성과 모호함이야 말로 그의 작업을 이해하는 가장 중요한 키워드라는 점이다. 그래서 장승효는 어떠한 정해진 지점이나 깔끔한 해석을 추천하지 않는다. 대신 개인과 전체, 평면과 입체, 주제와 배경, 사진과 조각 사이의 긴장관계를 의도적으로 유도한다. 그리고 이 긴장감으로 인해 장승효의 작품은 대단한 수준의 역동성을 확보하게 된다. 이 역동성은 새로운 정체성이 만들어지는 최고의 환경이다. 장승효의 새로운 정체성의 문제는 어떠한 방향으로도 나아가지 않는 것처럼 보일지도 모른다.